The eastern bluebird is a small thrush found in open woodlands, farmlands, and orchards. They can be found sitting on telephone wires or perched atop a nest box, calling out in a short, wavering voice or abruptly dropping to the ground after an insect. Marvelous birds to capture in your binoculars, male Eastern Bluebirds are a brilliant royal blue on the back and head, and warm red-brown on the breast. Blue tinges in the wings and tail give the grayer females an elegant look. They commonly use nest boxes as well as old woodpecker holes and typically have more than one successful brood per year. With the proliferation of nest boxes and bluebird trails, bluebirds are now a common sight along roads, field edges, golf courses, and other open areas. Can be found locally at Bacon Creek Park and Stone State Park. Loess Hills Audubon Society meets at the Dorothy Pecaut Nature Center, 4500 Sioux River Road the first Thursday of the month during the months of October thru May at 7:30 P.M. The first meeting of the year is the annual potluck at Stone Lodge in Stone State Park at 6:00 P.M.
Each of these meetings includes a quality program of various subjects. The public is invited and welcome to attend these meetings. Check the Meetings Page for information on upcoming programs. 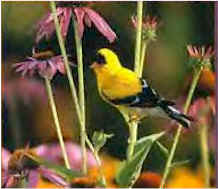 Birding outings occur monthly. The public is invited and welcome to attend these outings. Check the Outings Page for information on upcoming outings. The Loess Hills Audubon Society exists to educate individuals and the general public, to enjoy and promote birding, to support ornithology, and to be an advocate for wild areas and environmental issues. "Loess Hills Audubon Society is a Chapter of National Audubon Society, Inc."
North America’s littlest falcon, the American Kestrel packs a predator’s fierce intensity into its small body. It's one of the most colorful of all raptors: the male’s slate-blue head and wings contrast elegantly with his rusty-red back and tail; the female has the same warm reddish on her wings, back, and tail. Hunting for insects and other small prey in open territory, kestrels perch on wires or poles, or hover facing into the wind, flapping and adjusting their long tails to stay in place. American Kestrels nest in cavities, although they lack the ability to excavate their own. They rely on old woodpecker holes, natural tree hollows, rock crevices, nooks in buildings and take readily to nest boxes. Resident to long-distance migrant. While some American Kestrels migrate to Central America, the great majority spend the winter in the southern United States. Can be found locally in open areas perched on wires or poles.